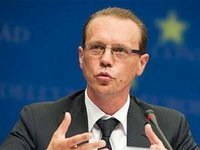 Former European Commissioner for Taxation, Customs, Statistics, Audit and Anti-Fraud Algirdas Semeta has been appointed Business Ombudsman for Ukraine's Anti-Corruption Initiative, the European Bank for Reconstruction and Development (EBRD) office in Kyiv has said in a statement. "The governing body of this Initiative unanimously nominated and the Cabinet of Ministers approved the former European Commissioner for Taxation, Customs, Statistics, Audit and Anti-Fraud Algirdas Semeta for the position of Business Ombudsman," the statement reads. With the creation of this new institution, businesses will be able to report claims of unfair treatment and corruption. The office of the Business Ombudsman will assess the claims. Where it concludes that the alleged malpractice may have occurred, it will be able to request further investigation by the relevant bodies and seek to have these complaints addressed by governmental authorities. It will periodically report to the general public, including the business community, about the progress made in the fight against corruption. "By accepting this very challenging job, I will make a positive and practical contribution to the improvement of the business climate, combating corruption and promoting best international practices in Ukraine," newly appointed Business Ombudsman Semeta said. Ukraine's Anti-Corruption Initiative was established in May 2014 and agreed under a Memorandum of Understanding between the Ukrainian government, international organizations, including the EBRD and the OECD, and the following Ukrainian business associations: the American Chamber of Commerce in Ukraine, the European Business Association (EBA), the Federation of Ukrainian Employers, the Ukrainian Chamber of Commerce and Industry and the Ukrainian League of Industrialists and Entrepreneurs. This follows Ukraine's decision to call in the OECD to help tackle corruption, strengthen its tax systems and improve competitiveness. The institution of Business Ombudsman is "a kind of attorney for business" and "the Business Ombudsman for investors is an independent person entitled to appeal publicly to the government if corruption in customs, tax services, public authorities or state regulators is being detected or where the rights of entrepreneurs are impaired," Vice-President of the Federation of Ukrainian Employers Dmytro Oliynyk said. "Speaking on behalf of 900 companies operating in Ukraine, the European Business Association supports the Anti-Corruption Initiative. We believe our synergy will make the fight against corruption possible provided there is a political will and commitment from the Ukrainian government and policymakers," EBA Executive Director Anna Derevyanko said. As was reported, Ukraine's Cabinet decided to set up the Business Ombudsman Council as its permanent advisory body (Cabinet resolution No. 691 dated November 26). The Council consists of the Business Ombudsman, two deputies and employees of the secretariat. EBRD Director for Ukraine Sevki Acuner in late November announced the decision to allocate EUR1.5 million annually to fund the office of the Business Ombudsman. Algirdas Semeta served as Minister of Finance in the Government of Lithuania from 1997 to 1999 and again from 2008 to2009. From this position he was nominated to become European Commissioner, first for Financial Programming and Budget (2009-2010) and then for Taxation, Customs, Statistics, Audit and Anti-Fraud (2010-2014).